Screenshot of LUTV footage by Caitlin Baker VP for the Board of Education of St. Louis David Jackson encourages parent involvement in the Normandy School District. 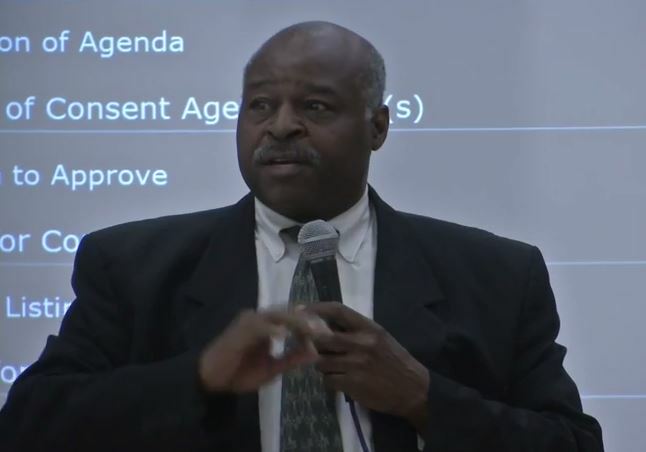 Published April 29, 2015; 4:40 p.m.
Parents and administrators of the Normandy School District, which lost its accreditation two years ago, held a public hearing on April 23 to weigh in on what to do next. VP for the Board of Education of St. Louis David Jackson encourages parent involvement in the Normandy School District. The Normandy Schools Collaborative hearing was open to the public and gave parents an opportunity to voice their concerns. The vice president of the Board of Education of St. Louis, David Jackson, told parents to take action. Normandy Interim Superintendent Charles Pearson said parents should be more concerned with helping the students pass the Missouri State Assessment. Paul Davis said he attended the hearing, looking for new information about the transfer program’s funding. Davis’ son participated in the Normandy transfer program before it was pulled last July. When the program was pulled, the Davis family began searching for housing in St. Charles, with hopes of enrolling his son in the Francis Howell School District. Now that a court ruling has reinstated the transfer program, Davis will do whatever it takes to keep his son at Francis Howell North. The Normandy School District has three years to regain accreditation. The upcoming state assessment is one criteria currently being used to ensure Missouri school districts’ performance. Normandy must pass the assessment to take the next step forward.